Located in a popular residential location and offering spacious accommodation throughout is this extended and well presented 4 bedroom semi detached family home that should be viewed to be fully appreciated. This gas centrally heated and uPVC double glazed property comprises on the ground floor of an a good sized entrance porch, large hallway, living room with open aspect views, L shaped kitchen/dining room with a built in 4 ring gas hob and an eye level double electric oven and grill, small sun room/rear porch, useful utility room and a small WC. On the first floor are 4 bedrooms, a modern fitted white suite bathroom and a small shower room. 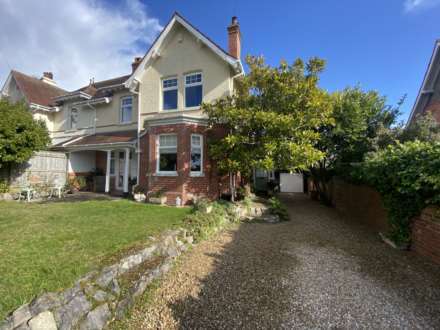 Further benefits to the property include a driveway that provides off road parking for 2/3 motor vehicles, garage/store and an enclosed, south facing and tiered garden to the rear, that enjoys panoramic views of the Estuary. Modern white site comprising of a low level. Wash hand basin. Tiled splash backs. Large window to front with open aspect views. 3 x Radiators. TV point. Wall mounted electric fire. Window to side and an internal window to rear. Fitted floor standing and wall mounted cupboard and drawer storage units with roll edged work surfaces and complimentary tiled splash backs. Built in 4 ring gas hob with a built in, eye level, double electric oven and grill to side. Inset, composite single bowl sink and drainer unit with a mixer tap above. Space and plumbing for a dishwasher. Space for a fridge under the work surface. Concealed, wall mounted gas fired boiler. Windows to rear and a part glazed door to the side, leading out to the rear garden. Laminate flooring. Radiator. Access to an insulated and part boarded loft space via a trapdoor and ladder that has a light connected. Airing cupboard with slatted shelving and also housing the hot water tank. Doors leading to all bedrooms, bathroom and the shower room. Window to front with open aspect views. Radiator. Large built in double wardrobes with hanging rails. Window to rear with open aspect views. Radiator. Built in storage cupboards. Wash hand basin. TV point. Obscure glazed window to rear. Spacious, modern fitted room with a white suite comprising of a panelled bath with tiled splash backs above and a shower attachment. Low level WC. Bidet. Stylish, circular wash hand basin with a display to side and storage cupboards below and to the side. Radiator. Vinyl flooring. Obscure glazed window to rear. Walk in, single shower with an electric shower above, shower curtain and rail and tiled splash backs to ceiling height. To the rear of the property is an enclosed and tiered garden that faces in a southerly direction and which enjoys panoramic views of the Exe Estuary from the top. Laid immediately to the rear of the property, is a level patio area, that is a real sun trap and which has steps that lead up to a paved patio area. Both of these areas provide an ideal area for outdoor dining and sitting during finer weather. Further steps then lead up to a level area of shingle which has shrub bed borders. Small storage shed. More steps then lead up to a further shingle area that has a raised decked seating area, which enjoys panoramic views of the Exe Estuary and the hills beyond. Outside water tap and lighting. From our prominent town centre office, turn right down Rolle Street and then turn right at the roundabout onto the Parade. Proceed into Exeter Road and take a right hand turning into Withycombe Road. At the roundabout turn right into Marpool Hill and 1st left into Ashleigh Road. The property will be found on the right hand side, once the road levels out.